For the last year, Charlotte Hall Veterans Home Director, Sharon Murphy has served as the President of the National Association of State Veterans Homes (NASVH). Shown in this photo from left to right are: Heywood Hilliard, Vice President HMR, Sharon Murphy, Director of Charlotte Hall Veterans Home, Russell Keogler, Administrator of Charlotte Hall Veterans Home and Peter Pantzer, MDVA Fiscal Director. The photo was taken at the NASVH Conference. MDVA bids farewell to the interns who helped us this summer, and wishes them well as they return to school. 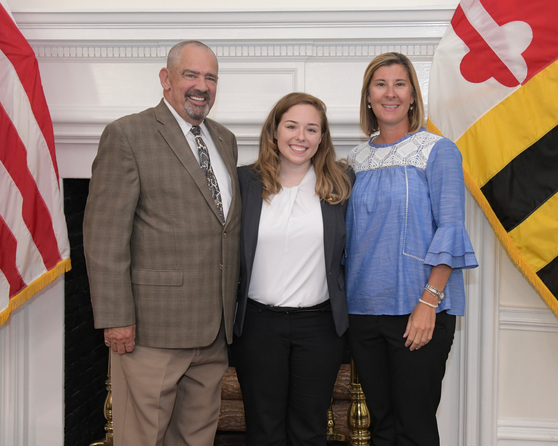 In this photo from left to right: MDVA Secretary George Owings, Morgan Smith, a participant in the Governor's Summer Intern Program and Dana Burl, MDVA Director of Outreach & Advocacy. Not Shown: Andrew Altman, who also volunteered at MDVA this summer. Members of the Order of the Eastern Star met with Secretary Owings and presented a generous donation to the Veterans Trust Fund. 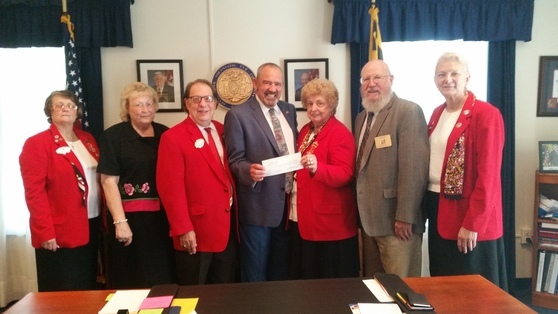 From left to right: Karen Calvert, who serves on the Maryland Veterans Commission and also is the Worthy Grand Matron, 2018-2019, Grand Chapter of Maryland, Cassandra Bonchu, Russell Bonchu, Secretary Owings, Madge Jones, Stan Seidel, a Maryland Veterans Commissioner who volunteers with the Veterans Trust Fund, and Pat Burt. Thank you to all of the members of the Order of the Eastern Star who donated to the Maryland Veterans Trust Fund. 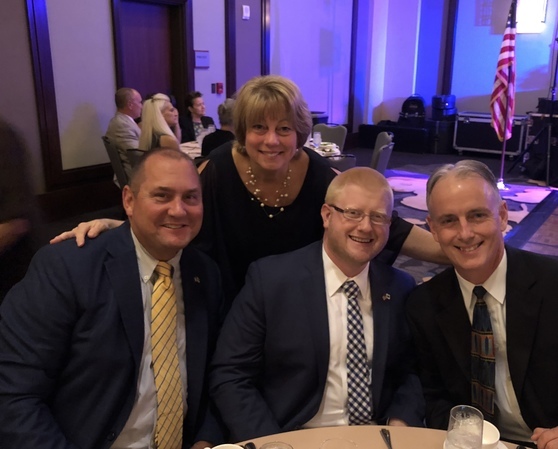 Secretary Owings recently served as the Keynote Speaker at the Fleet Reserve Association East Coast Region Convention, where he also pinned several Vietnam and Vietnam Era Veterans with the Vietnam Veteran Lapel Pin. Shown in this photo with Secretary Owings are: Shipmate Arthur W. Roman, Sr., Fleet Reserve Association Branch 212 from Ft. Meade, and Maryland Veterans Commissioner Penny Collins, who is also a Shipmate with Fleet Reserve Association Branch 24 from Annapolis. The Women Veterans United Committee, Inc. recently celebrated the 3rd Anniversary of the organization. 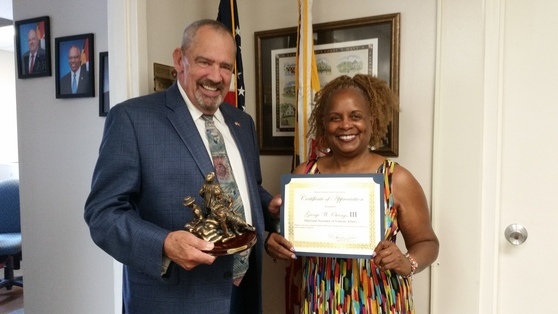 Penny Collins, who also serves on the Maryland Veterans Commission presents Secretary George Owings with an award from the Women Veterans United Committee, Inc. The Maryland Department of Veterans Affairs (MDVA), in collaboration with the Maryland Department of Transportation Motor Vehicle Administration (MDOT MVA), announced today the release of its redesigned Disabled Veterans license plate. The new plate adds color and prominently features red, white, and blue stripes with stars to symbolize service to country. It continues to feature the letters “DV”, to designate the driver as a disabled veteran, however “Disabled Veteran” is now spelled out in red along the bottom of the plate. The idea for a new plate came after George Durgin, Capt., U.S. Public Health Service and Maryland resident, saw a variety of veteran plates with patriotic designs at Walter Reed National Military Medical Center. Capt. Durgin contacted the MDVA’s Outreach Program and suggested a new plate design. He provided photos of other state’s plates which served as a baseline for the MDOT MVA’s design of a new Maryland military plate for disabled veterans. The plate is now available at the MDOT MVA for eligible veterans. "Our administration is committed to ensuring our military, veterans, and their families are recognized for their service," said Governor Larry Hogan. "The newly designed Disabled Veteran Plate is one more way we can show our gratitude and honor the men and women who have sacrificed so much for Maryland and our nation." “The newly designed Disabled Veterans plate is just another example of MDOT MVA’s commitment to honoring the veterans who courageously served our country. We appreciate Capt. 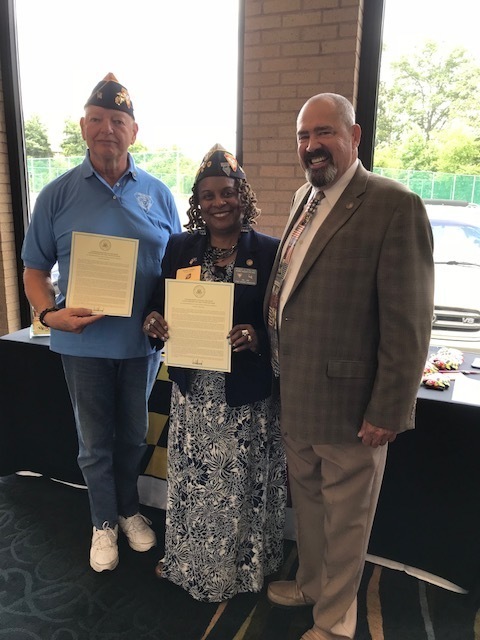 Durgin’s recommendation as we continue to look for additional ways to honor our veterans and deliver premier service to all Maryland residents,” said MDOT MVA Administrator Christine Nizer. The MDVA is a State Government Executive Department with a service mission to assist veterans, active duty service members, their families and dependents, in securing benefits earned through military service. Under the Department of Veterans Affairs are five major programs: The Veterans Cemetery and Memorial Program; Charlotte Hall Veterans Home; the Veterans Service and Benefits Program, Outreach and Advocacy Program, and the Maryland Veterans Trust. 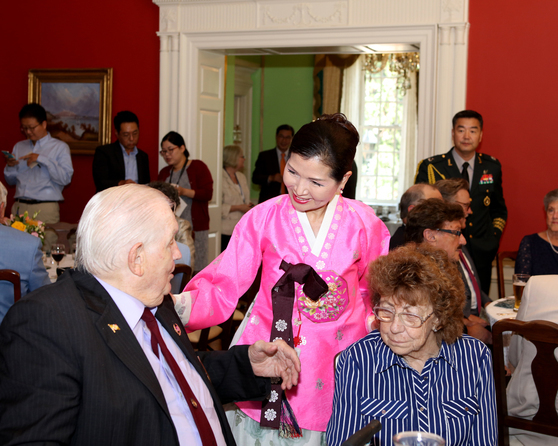 Former Maryland Veterans Commissioner Raymond Glock and Ms. Marilyn Baldwin are greeted by First Lady Yumi Hogan at the Welcome Home, Korean War Veterans reception at Government House. ANNAPOLIS, MD - Governor Larry Hogan issued a proclamation calling for bells to be tolled in Maryland on November 11, 2018 at 11:00 am in remembrance of veterans of World War I. The proclamation coincides with a call by the United States World War I Centennial Commission for all Americans to participate in a national tolling of bells. Sunday, November 11, 2018 marks the 100th anniversary of the signing of the Armistice which ended World War I. To commemorate the occasion, in 2015 Governor Larry Hogan created the World War I Centennial Commission through an executive order to create ways for the state’s residents and its visitors to remember, commemorate, and learn about the meaning of World War I and the role of Marylanders during that time. In addition, the commission is tasked with developing activities and events to recognize the anniversary. Under the leadership of the Governor’s Office of Community Initiatives, the Commission has worked towards preserving and promoting the history of all 62,000 Marylanders who served in World War I, including 11,000 African Americans and 6,000 women. Marylanders are asked to toll the bells twenty-one times with a five-second interval between tolls beginning at 11:00 am on Sunday, November 11, 2018 in commemoration of the armistice. Organizations, towns, churches and museums across the state will also participate by listing the names of those involved in the Great War from their site. The action of tolling the bells has historical significance as a signal indicating the end of World War I. During the War, all church bells were silenced only to ring as a warning of invasion by enemy troops. The Maryland Department of Commerce today announced the designation of a new BRAC Revitalization and Incentive Zone in Harford County. Located in Edgewood, Md., the new BRAC zone encompasses land on the north side of the MARC railroad line bordering Aberdeen Proving Ground South, accessible by Route 755 to the east, U.S. Route 40 to the north, and to the west along Route 24 to Trimble Road and Fulfillment Drive. The 855-acre Edgewood BRAC Zone is located within the Edgewood/Joppa Enterprise Zone. A Ribbon Cutting will be held for the VA Community Based Outpatient Clinic (CBOC) located in Gaithersburg on September 7, 2018, and the Clinic will open for appointments on September 10, 2018. The Clinic is located at: 15819 Gaither Road, Gaithersburg. Frostburg State University student and USMC Veteran Kodi Bowers was selected as the Raven's Hometown Hero honored at the August 9th game.